In 1935, Saints created a premiership record when they slaughtered the newly formed Canterbury 91-6 (this equates to 110-6 on modern scoring). The 30s also saw the demise of one of Rugby League's battler clubs, University in 1937. By the end of the decade, World War II was declared and like most teams, Saints were hit hard when a number of players left to join the fight. In 1935, St George narrowly missed out on the semis and ended up finishing the season in sixth position. Earl Park, 11 May 1935: Saints delivered a stunning footballing lesson to competition newcomers, Canterbury - Bankstown when they posted a record premiership win of 91-6 (NB: this equates to 110-6 on modern scoring). One can but imagine what was going through the minds of the slaughtered as they came to terms with a premiership loss that in all likelihood, will never be surpassed. Canterbury opened the scoring with two goals from the boot of Carey and led 4-0. But St George cut loose, running up a half time lead of 21-6. Saints' line was never crossed and by full time, as they scored 19 tries and 17 goals as every player in the team made it onto the scorecard. St George winger, Les Griffin posted a club record for most points and goals scored in a first grade match when he posted 36 points (2 tries, 15 goals). This 36 points record only being equaled in 1947 by Jack Lindwall. (NB: Griffin's and Lindwall's record stood as an all-grade club record. But this was broken decades later when third grader Wes Naiqama score 38 points in a Jersey Flegg match in 2002). Les's record of 15 goals in one match still stands not only as a club record but it is also a competition record held jointly with Easts' Dave Brown. Tries: Max Hollingsworth 4, Len Kelly 3, Les Griffin 2, Percy Fairall 2, Jim Rutherford 2, J. Flower, P. White, Bill 'Wombo' Killiby, Eddie Root, Charlie 'Chikker' Rice, Fred 'Yappy' Gardner. Goals: Les Griffin 15, Stan Robinson, Jack Lynch. St George's massive win over Canterbury was to compete with the tremendous year that Easts were having. Easts were handing out numerous thrashings in 1935 including an 87-7 clubbing of Canterbury just one week after the 'Earl Park Massacre'. (For the record, Canterbury conceded a record 660 points after 18 rounds). Additionally, Easts sent many teams home with scores of 40 or more against them and posted several more scores of 50 and 60 plus. Saints held their own against Easts that year, losing both encounters 16-8 and 16-13. This is despite the fact that in 18 rounds Easts scored a mammoth 599 points which included 131 tries, almost twice as much as their nearest rival. Needless to say, Easts went in to win the title in 1935. Nevertheless, despite the dominance of Easts, Saints showed a clean pair of heels to many teams. Saints' big signing of 1935 was tough prop forward, Eddie Root. Eddie brought with him a wealth of knowledge. In addition to his state rep appearances, Eddie also played as a 1929 Kangaroo. Earl Park, 29 August 1936: University scored a rare win, defeating St George narrowly by 13-11 in the final round of the 1936 season. Uni's last win was in round one of 1934, the best part of three season ago. Since then, they have lost 42 games in a row giving them the unenviable record of the longest losing streak in Rugby League history, a feat that is unlikely to be surpassed. Notice has been placed on University by the NSWRL to get better results or find themselves out of first grade. Rugby League's battlers have been given one more season to prove themselves, a task that seems beyond the struggling club. In the meantime, the St George team, captain-coached by Eddie Root (in his last season) had an ordinary year finishing with just three wins, 10 losses, two byes for a ladder points total of 10 points. Saints finished in 8th position, saved from the wooden spoon by last placed University. Sydney Cricket Ground, 22 May 1937: St George and Uni met for the final time in the penultimate round of the 1937 season. In a one sided match, Saints overwhelmed the hapless University team who have been unable to win a single game all year. Saints recorded their 2nd biggest win by running in 15 tries to one to crush University 65-5. Since entering the competition in 1921, Saints have beaten University 17 times and lost to them three times. Ironically, University recorded their biggest ever win against Saints in 1933 when they won by 42-8. University will not be competing in 1938. Earl Park, 19 June 1937: Saints played their final game of the year defeating Newtown 19-11. Only nine rounds were played in 1937. There were no semi-finals and Easts have been declared the premiers by virtue of the competition ladder which sees them being undefeated on 16 points. Easts' season included two draws, one of which was against St George (10-all in May). Saints did well by posting five wins, two losses, one draw and one bye to finish the season with 13 points, equal with Souths in second position. Saints for and against sees them finishing the year in third position. 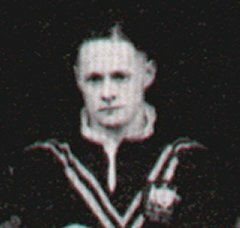 Port Kembla winger, Charlie 'Saus' Hazleton has the distinction of being Southern Division's first international when selected on the '37/38 Kangaroo tour after representing NSW. He played one Test in NZ and 15 games in the 1937 Kangaroo tour. North Sydney Oval, 13 August 1938: In front of a small crowd Norths defeated St George 23-20 thus confirming Saints as the year's last place-getters. Saints won three, drew one and lost 10 matches, including a losing streak of the last 5 games. Saints were still a chance of avoiding the wooden spoon if they could muster a win against Norths but were unable to do so. At the end of year 'post-mortem' a few Saints' officials were heard to vow that no future St George team would ever cop the wooden spoon again! In 1938, Saints signed promising centre/winger Jack Lindwall (pic right). ST GEORGE REBUILD AND SUCCEED! Sydney Cricket Ground, 26 August 1939: Saints went down in the minor semi final 23-10 to Souths in front of 21,722 spectators. But they can be pleased with a successful season. Under the guidance of new captain-coach Neville Smith (pic right), Saints have been trying to re-build their reputation after coming last in 1938. Neville comes from Valleys (Bris) and at 22 he is the youngest ever captain-coach in the history of St George. Coming into the semis, Saints were second on the ladder and had an impressive list if victories throughout the year. With 10 wins and four losses after 14 rounds, Saints have had an almost complete reversal of form. Kangaroo winger and Port Kembla lad, Charlie Hazelton scored 17 tries (14 rounds) in his first season with Saints. On August 12th, the last round of the premiership, Saints and Balmain battled it out for the minor premiership. Balmain won a tight match 11-10. Balmain went on to win the Final against Souths and claim the premiership. ||||||1930s FULL OF MIXED FORTUNES|||||| The 1930s were not easy for Sydney-siders. The Great Depression had brought about hard financial times and most were doing it tough. Despite this, crowd numbers to Rugby League matches were on the increase as people tried to escape the harsh realities of life.